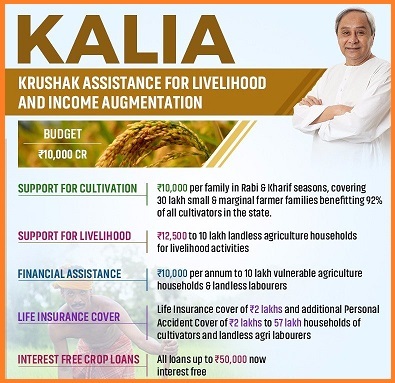 The Odisha Cabinet headed by CM Naveen Patnaik has unveiled the Krushak Assistance for Livelihood and Income Augmentation (KALIA) scheme to empower small, marginal & landless farmers as well as landless laborers. The KALIA Scheme is Rs 10,000 crore scheme, which would be executed through Direct Benefit Transfer (DBT) mode, covers 92% (over 30 lakh) of cultivators, loanee and non-loanee, share-croppers & landless laborers. According to the KALIA scheme, an amount of Rs 10,000 per family at the rate of Rs 5,000 each for Kharif and Rabi seasons shall be provided as financial assistance for taking up cultivation. This assistance is for five crop seasons spanning three years from 2018-19 to 2021-22 and is also not linked to the extent of land owned thereby benefiting share croppers and actual cultivators most of whom own very small extent of land. The KALIA scheme also has a component for about ten lakh landless households in the form of livelihood support by providing each household a unit cost of Rs 12,500 to take up activities like goat rearing units, mini layer units, duckery units, fishery kits for fishermen and women, mushroom cultivation and beekeeping. Beside this, annual financial assistance of Rs 10,000 per household will be provided to take care of sustenance of farmers not able to take up cultivation due to old age, disability, disease or other reasons. Life insurance cover of Rs 2 lakh and additional personal accident cover of Rs 2 lakh will also be provided to both cultivators and landless agriculture laborers covering about 74 lakh households.